DATABASE INDEX is used to find, sort and group the data in a fast and efficient way. These indexes can be created using one or more columns and creating index to a column generates an extra hidden column holding the same data sorted with a handle to the original data. Hence it allows the database application to find the data fast without reading the whole table. 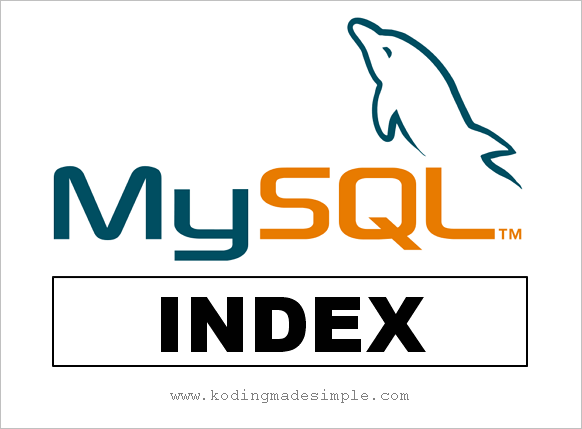 Today we’ll see how to create and drop index in mysql database table. It creates an index with the name ‘bk_index’ for the field (column) ‘book_name’ in the table ‘books’. Index allows duplicate values for a column, but if you want to ensure no two rows have the same index value then using the UNIQUE INDEX is the solution. Where ‘books’ is the table name and ‘bk_index’ is the index name. If you don’t specify name for an index mysql will assign a default name for the index. If you don’t know the index name to drop then using the SHOW INDEX statement will list all the indexes associated with a particular table. I hope now you have better understanding of creating and dropping index on mysql database table.